The Geelong team looks ready to introduce some permanent fresh faces for the first time in a few years. They have a few young players that have had a year or two in the system, are strong bodied and have been training with the strongest team in recent history. Mitch Duncan is ready made and one of them. Why should I pick him?For those who don’t know much about Mitch, he is a medium-sized forward/midfielder, who was selected in the junior All-Australian side after the 2009 NAB AFL Under-18 Championships. For obvious reasons, his opportunities were limited last year with the Cats having one more crack with their “dynasty” squad. This year however, especially with a new coach, positions will be available for those who put their hand up. Last year Mitch proved he has ability with 5 of his DT scores above 70. It should be reasonable to think he will have a far more significant role this year, significantly improving his scores. If he manages to maintain dual positioning, his stocks will rise significantly. 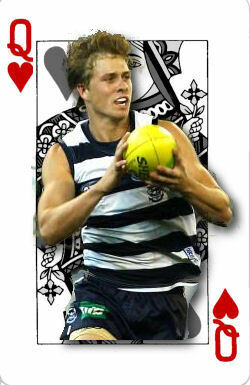 Why shouldn’t I pick him?Even without Gaz in the middle, Geelong are still blessed with one of the best midfield’s in the AFL making Mitch’s potential role in the guts, “no walk in the Kardinia Park”. Haha, that joke was “Skilled”. Hmmm, bad jokes aside, Mitch was unable to score 100 in his first 8 attempts, even in the high scoring, free flowing Cats of the recent past. With more of a defensive approach inevitable, the question need to be asked whether he is a scorer. Deck of DT Rating. 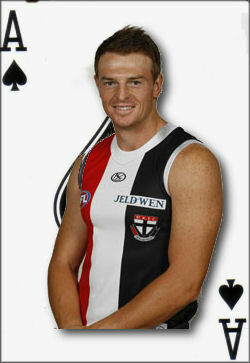 QUEEN – The only reason I have rated him above a Jack is that he will not come at a basement rookie price. I think Duncan has serious potential to be a consistent contributor, and the dual position may just help him over the line to save the odd doughnut cause by injuries and the byes. With alot of people considering a team makeup of rookies/stars, It could be the teams that sneak a couple of Mitch Duncan types amongst the rookies that come out smiling. A year in the system, especially with a team like Geelong is invaluable.